On Aug. 2, 1990, Iraqi soldiers invaded the Gulf state of Kuwait in the early morning hours, precipitating the start of the Persian Gulf War. At around 2 a.m. local time on Aug. 2, 1990, more than 100,000 Iraqi troops crossed the border into Kuwait. Within just a few hours the first Iraqi troops had reached downtown Kuwait City, waving flags and taking up their positions. The Iraqis bombed the sheik’s Dasman Palace on the banks of the Persian Gulf and stormed into the city with helicopters and tanks, taking control of the international airport and the central bank. Sheik Faud al–Ahmad al–Sabah, the younger brother of Kuwaiti leader Emir Sheikh Jaber al-Sabah, who had fled to Saudi Arabia, was killed. Thousands of foreigners were forbidden to leave Iraq or Kuwait for several days after the invasion. A British Airways flight from London to Kuala Lumpur, Malaysia, was scheduled to stop at Kuwait International Airport to refuel the morning of Aug. 2. All 367 passengers on board Flight 149 were taken hostage by the Iraqi army to be used as “human shields” alongside other Westerners. Weeks later, there was international outrage over an Iraqi TV broadcast in which Saddam Hussein was shown with the Western hostages, calling the detainees his “guests.” The passengers were held hostage for three months. Iraq established a provisional government and on Aug. 8, it announced that it had annexed Kuwait. The United States and United Nations immediately condemned the invasion, and called for Saddam Hussein to withdraw his troops from Kuwait. The UN also imposed economic sanctions. On Nov. 29, the UN Security Council passed a resolution stating that its member states could use “all necessary means” to drive out Iraq from Kuwait if Iraq remained after Jan. 15, 1991. 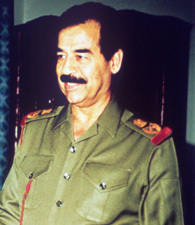 Even as the date approached, Saddam remained adamant against withdrawal. When last-ditch efforts proved unsuccessful, the U.S.-led allied forces launched an air attack into Baghdad in the early hours of Jan. 17. A massive offensive on land began on Feb. 24, dramatically reducing Iraqi resistance. After just 100 hours a ceasefire was declared, thus ending the war. Iraqi troops were forced from Kuwait, but the coalition stopped short of removing Hussein from power. A 1996 episode of PBS’ Frontline looks back at the Gulf War through interviews with world leaders, commanders and Iraqis, stories from soldiers, and a four-part BBC radio series.